Laughter is the best medicine or so they say. If you don’t have friends or family around to make you laugh then a Netflix and chill night can do the trick or Spectrum TV’s on-demand. and what can you learn from him? Gabriel Iglesias is one of the most successful highest paid comedians alive. But, he didn’t start that way. He was born in California to a single mother and was the youngest of 6. To cope with the rough upbringing he learned to laugh, and more importantly make other people laugh. He lived a “normal” life, for the most part, going to school, finding work, etc. In 2000 however, he was done. He quit his job at a cell phone company to pursue comedy full-time, going against the wishes of his family. His first real success came that same year appearing on Nickelodeon’s All That with stars Amanda Bynes and Nick Cannon. He used his humor and skill at making voices to find more work on such projects as Family Guy, The Emperors New School, Magic Mike, and The Nut Job. After rising to fame he then started his own show, as well as several specials on comedy central and later Netflix. Gabriel Iglesias net worth is $30 million dollars. Not bad for someone who basically just tells jokes. Though it’s true so much more work is involved than just telling jokes. Things like practicing, making sure jokes work on crowds, and getting more material from his life. On top of that, there is a lot of travel, time away from family, and long days. 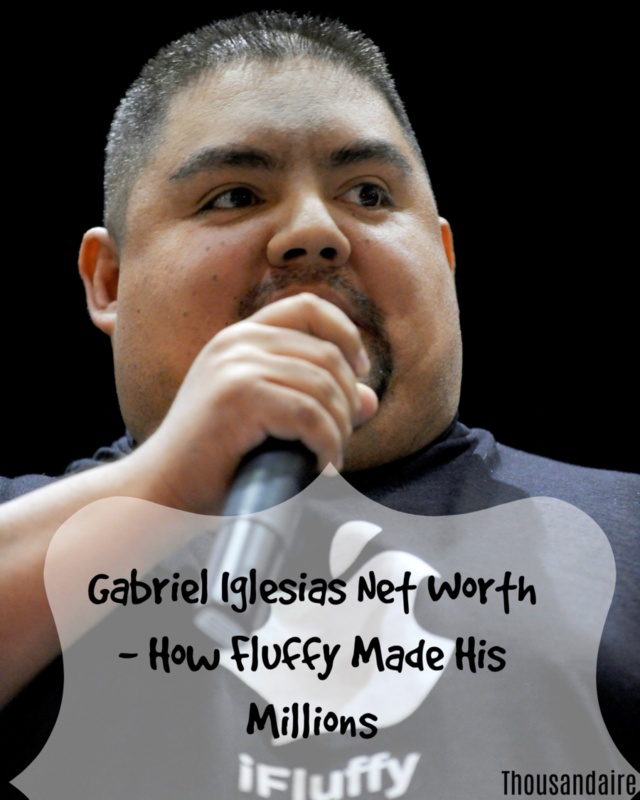 Gabriel Iglesias net worth didn’t all come at one time. He had to start off small working in clubs for little to no money. If you have a dream take small steps to get there, even if it’s just 15 minutes a day. A million little steps can take you a lot farther than 100 large ones. Family can sometimes not uplift or get you where you want to go. Gabriel Iglesias own mother strongly encouraged him to not leave his job to pursue this. Sometimes our friends and family can give advice, even strong advice, that they really think is for our best. However, sometimes we know that we can make it even when no one believes in us. If you have a dream, believe in yourself and work towards it. Don’t let anything stop you. A pain for you can be a pain for others. Gabriel Iglesias was given just 2 years to live due to his weight and diabetes. He changed his diet, started working out and lost over 100 pounds. To lose weight he created an entire product line in order to help him do so and then sold it to others to make himself money. Odds are if something bothers us it bothers others too. Creating something to solve our problems could help others and give us a nice income. Interesting story. Is his huge net worth mostly from high income, or smart money management? I would say a large portion would because he is such a high-income earner more than a saver. Nothing wrong with having a high income though.